Need an easy, make-ahead appetizer for guests to snack on before the big game starts? Don’t miss our Spicy Sweet Pretzel Nut Snack Mix! 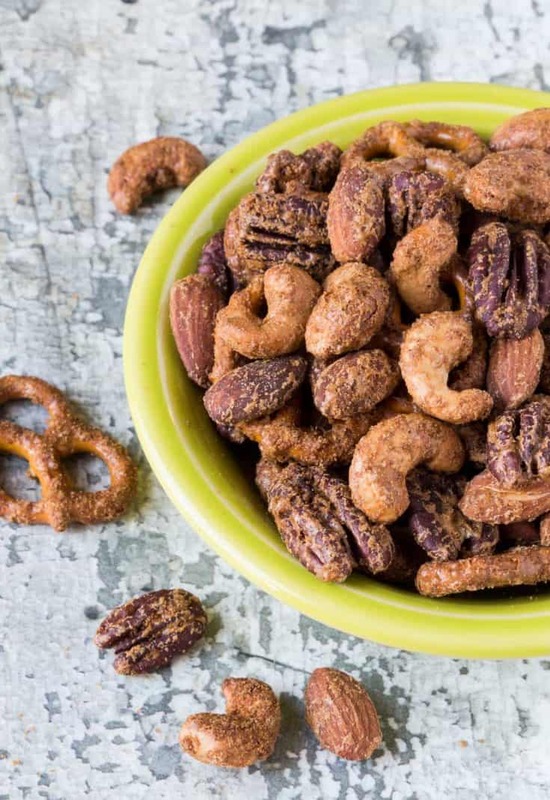 We’re NUTS about this Spicy Sweet Pretzel Nut Snack Mix (pun intended). Lame pun aside, we seriously love this snack mix. 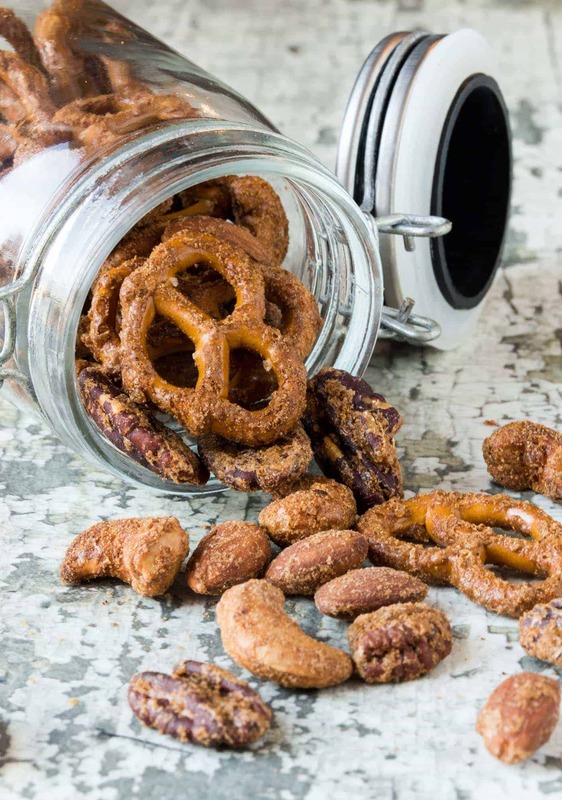 There are numerous roasted nut recipes out there (including our addicting Chipotle and Rosemary Roasted Nuts), but this one takes it a step further with the addition of crunchy pretzels and a sweet and spicy coating. There is something irresistible about that salty sweet – with just a little bit of heat – flavor combination that we can’t stop eating. And we’re confident your guests will agree. Nothing beats a make-ahead appetizer for busy hosts, and this Spicy Sweet Pretzel Nut Snack Mix can be made at least a week ahead of time. How’s that for a time saver? It only takes about 30 minutes of cooking time to pull this recipe together. But be forewarned; you may want to hide the container of this Spicy Sweet Pretzel Nut Snack Mix because keeping your hands out of it is pretty tough. Either that or make two batches – one for you to get your salty sweet fix now and another for the party later. Tip: You can use any variety of raw nuts in this Spicy Sweet Pretzel Nut Snack Mix. I used my favorites – pecans, cashews and almonds – but any mix would be tasty. (I’m thinking of adding some buttery macadamia nuts the next time I make it.) It’s also a great way to use up those leftover bits of nuts from other recipes that tend to accumulate in your pantry. So this Spicy Sweet Pretzel Nut Snack Mix is portable, does not require refrigeration AND can be made in advance. It might just be the best party appetizer ever! Spread nuts on a baking sheet and bake in preheated oven for 10 minutes, stirring halfway through. In a large bowl, whisk together the butter, brown sugar, cinnamon, red pepper and maple syrup. Stir the warm nuts into the butter mixture. Gently stir in the salt and pretzels until everything is evenly coated. Pour nut mixture back on the baking sheet, separating clumps as needed, and bake for 13-17 minutes, stirring twice. Allow to cool on baking sheet and separate any remaining clumps as needed. Store in an airtight container.